Saturday, December 6th was a great day for fans and friends of Dennis Wilson. Some of the first things people noticed as they neared the restaurant were the beautiful woody and hot rods sitting out in the parking lot, invoking the spirit of the "Noble Surfer" and "Mechanic" himself. The familiar harmonic strains of our favorite music wafted from the parking lot: Beach Boy tribute group "The Beach Toys" were on hand to entertain the early arrivals. 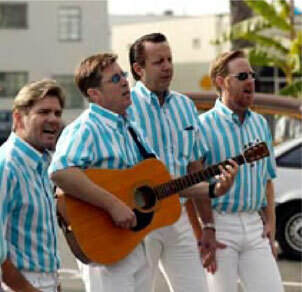 Dressed in the classic blue and white striped shirts and white jeans, the group perfectly evoked the early days of the Beach Boys. As these musicians re-created those beautiful harmonies a stone's throw from Santa Monica pier with a classic woody in the background, it seemed like the perfect way to get the event off to a great start.